I recently got the Harbor Freight lathe, and have been doing a little more turning. Nothing too fancy, mainly handles for things. I’ve seen a lot of guys using the carbide cutters, so I decided to give them a try. I love making tools, and the cost of the “good’’ carbide tools is $100 plus each. I think I have about $40 total into all three of these. It was a really fun build, and turned out as well as I hoped. -The steel is just 7/16” cold rolled steel round rod. I heated the shafts, and wiped on boiled linseed oil to blacken them. I tapped the ends with a simple tap and die set. -The ferrules are brass compression fittings from. -They’re finished with oil wax. I actually ended up cutting off the ends and re-doing the notches. They weren’t flat enough/too deep in this picture. I figured cutting little divots in the shaft would give the epoxy something to grab onto and keep the shaft from rotating or coming out. I have the H-F mini and it is a fine little machine; especially when it was cheaper than I could find even junky used ones for! Nice handles, Pete! 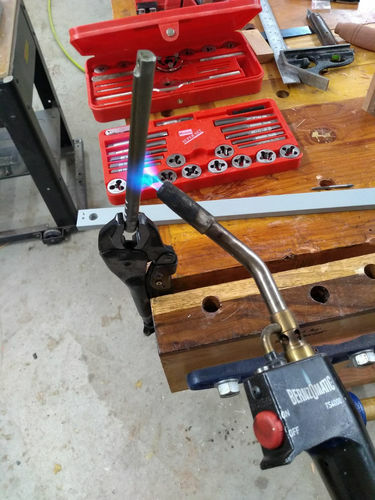 It’s nice using a tool you made yourself, too. You should get years of use out of them. These look great. It’s quite an advantage to have metal working skills. Pretty good build…Im curious to know how those carbide cutters hold up, I looked very closely at buying this same brand cutters but ultimately (I ran out of time for a project) and ended up buying a hollowing tool from one of the more expensive companies…But in the future, Id like to make my own as well. As long as we (turners) can source better valued quality tools, its a win win. Please update us in time if you can! Great job! Fine looking handles and excellent work. 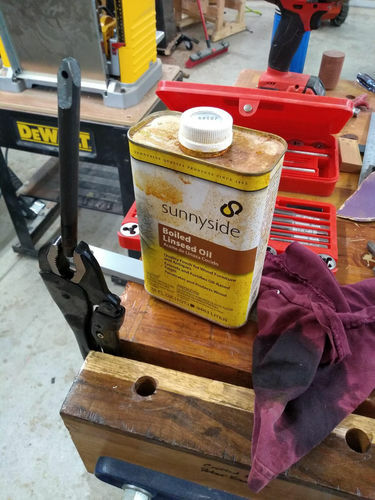 What size did you tap the screw hole? Is it SAE or Metric? I save old shock-absorbers for rod like this, have made several of my own chisels with them. Some times I’ve used square metal-lathe bits in a round hole in them with a set screw. They are pretty durable also. Old jack-handles/lug-wrenches, the old “L” shaped ones make good lathe tools also, very hard, and they have the bend in them already for some special purpose tool like a bowl or hollowing chisel that needs a little bend to it. I used old files years ago but so many people had them shatter that I quit doing that. Keep up the good work and that lathe will serve you for years to come. 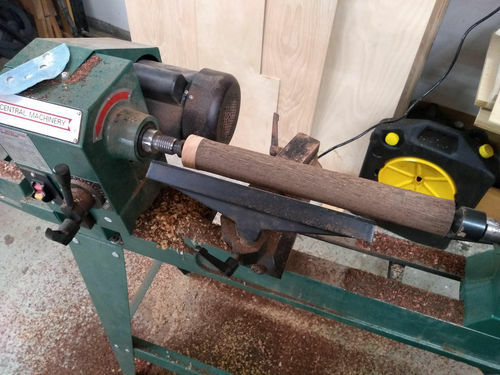 My first lathe was a home-built and we used it for years. Nice looking handles, while I find the carbide cutters work well, I’m always grabbing a HSS gouge still to do most my cutting. 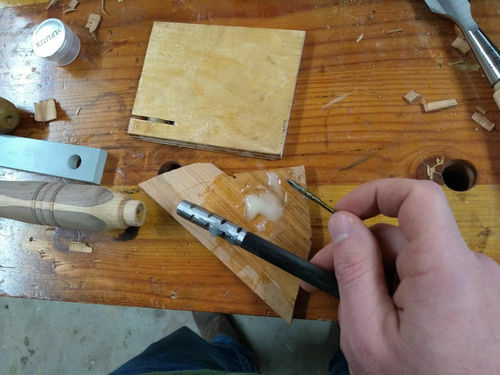 I had bought the easy wood set to start off and actually like the detail, diamond shape cutter for a lot of the finishing touches. Do have to agree with the consensus, cleaner cut with sharp HSS. Nice job on making those tools! They look quite nice and functional. I’ll try to remember to update you on how they last. I did use all of them on a couple little turnings, and they cut well. Obviously I can’t comment on the longevity of the carbide insert cutters yet. I really don’t turn much (YET). Great job! Fine looking handles and excellent work. What size did you tap the screw hole? Is it SAE or Metric? I save old shock-absorbers for rod like this, have made several of my own chisels with them. Some times I ve used square metal-lathe bits in a round hole in them with a set screw. They are pretty durable also. 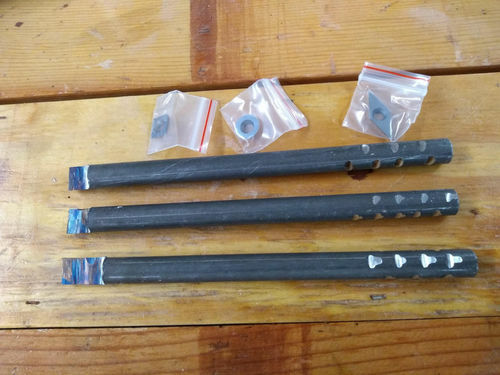 Old jack-handles/lug-wrenches, the old “L” shaped ones make good lathe tools also, very hard, and they have the bend in them already for some special purpose tool like a bowl or hollowing chisel that needs a little bend to it. I used old files years ago but so many people had them shatter that I quit doing that. Keep up the good work and that lathe will serve you for years to come. 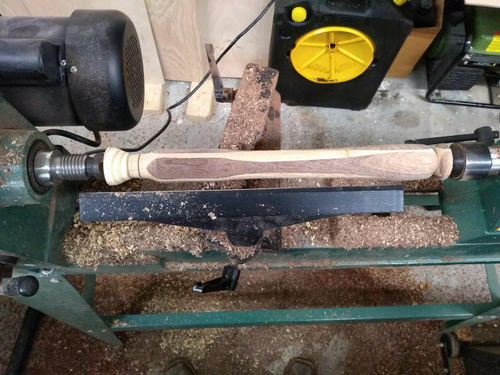 My first lathe was a home-built and we used it for years. If I remember right, the thread is an SAE 8-32? It’s not metric, I know that for sure.